The animation deals with the following aspects of Lenses : 1. Classification of lenses ? 2.What is the nature of the image formed by lenses? 3. Complete ray diagram This animated physics (optics) topic gives in-depth information about lenses and is very useful for schools and industry. How a lens becomes converging or diverging ? How to construct a ray diagram ? Why is the refraction taken to occur only once in a lens ? A lens is defined as a piece of transparent, optical material having one or two spherical surfaces (whose central axes coincide). A lens can have one spherical surface and one plane surface or it can have two spherical surfaces. When the surface is spherical, then it has some finite radius of curvature which can be measured. However if one surface is plane, its radius is considered to be infinite. 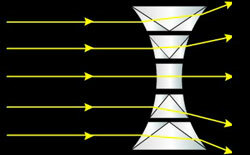 Diverging lens or concave lens. Each of the above category can have multiple types associated with it. Convex lenses can be of subtype as plano convex or concavo convex, or double convex lens similarly concave lenses can be of plano concave or convexo concave. A convex lens: a piece of transparent, optical material, having one or two spherical surfaces such that it is thicker in the middle and tapering at the edges . All of the above are thicker in the middle and tapering at their edges. 1/f=1/do + 1/di ; where do is the object distance and di is the image distance. A detailed description of how to construct a ray diagram for both types of lenses is shown, another area that is definitely confusing to beginners and is clearly explained through animation is why refraction is only taken to occur once for the ray traveling through the lens while in reality the ray undergoes medium change twice in the lens ? Ans: To improve the vision through the lenses and the appearance of the glasses, an anti-glare or reflective coating is applied. It consists of several layers of metal oxides applied to the front and back lens surface that has an index of refraction that is somewhere between air and glass. When applied in a thickness of about a quarter of light's wavelength, the two reflections from each side of the film basically cancel each other out through destructive interference, minimizing the glare you see. This is light that hits the back of the lenses and bounces into the eyes. The purpose of an anti-reflective (AR) coating is to reduce these reflections off the lenses. Because of the layering effect, AR coatings sometimes have a hint of green or purple color.